As the man said, as he took my signed papers, when I finally get notification that the Department of State has approved my renunciation in a couple of months' time, the date on all the paperwork will say January 30, 2018. My renunciation day. All the having to be my own travel agent, map reader, logistician and accountant aside, the big moment was the US embassy itself. I reread a good description of the renunciation process itself before I left home, and the part about the physical visit to a US diplomatic post was very helpful. I was (as is my habit) confused by where to stand, but a guard called to me and got me in the right place. He was Norwegian. I had to empty all my pockets, put my purse, watch, and belt in a small bin, and switch off my cell phone. I got a number, almost like getting a coat check ticket. Then I went to the sign that said "Wait here" and waited there. All of this was outdoors, in front of the guard hut or security forehouse or whatever they call it. You can see pictures of it here. Now you know which door me and my bin went through first. I was called in, handed my bin, and was told by another Norwegian guard to walk slowly through the metal detector. After that I got to select items to bring in with me (I chose wallet, passports, glasses, some papers), and then it was back outdoors for a few steps to the rear of the embassy building itself. We were two who had appointments at the same time, and nobody acknowledged that I had taken a queue ticket so I was second. When it was my turn no more than 5 minutes later, the Norwegian at the window told me he'd get my caseworker. The caseworker at the window was an American*, and asked me to first go pay at the cashier's window next to her. "How will you be paying, Miss Fox?" said the nice young lady there. "Credit card," I said, and put it in the little metal tray under the glass divider between us. "Oh, uh, I don't know the word in English, but…" "Skal vi ta det på norsk?" I asked. Yes, she too was a Norwegian. I had forgotten to change the "regionsperre" (that was the word she couldn't translate on the fly) on my credit card. So back out to the guard pavilion, get my purse, stand there and start the cell phone, log in to my bank and change the settings for my credit card to be allowed used in North America—because, duh, you're in the US when you're at the embassy—switched off the phone, put it back in my purse, put my purse back in the bin. And in the most Norwegian way, five guards were loitering around, talking about whatever while I was doing that. In Norwegian. Slow day at work. I went back to the cashier's window. Whereupon she charged me USD 2,350. Yes, over two thousand dollars to renunciate. Then back to window 4 where the lady there made me reread all the documents (DS-4080, DS-4081 and an information sheet) and since I'd filled them out, they were still correct, but now a man's name from the embassy had been added. Something that started with J. Then it was wait until my actual case worker was available. The guy ahead of me was ahead of me in room 6, too. Room 6 was window 6, but with walls and a door surrounding the two chairs in front of the glass divider with the metal tray. Mr. J (I assume) was also an American, neither pleasant nor unpleasant. Just there to walk me through this. After a few initial questions, it was on to the documents. Did I agree? Did I understand? Yes. "Sign this. And the copy." I could feel my insides shaking. I took a deep breath to steady my hand so my signature would match what I had on the passport. My US passport, brand new just a year ago, never used. Mr. J had my passport. He compared the signatures. Another document. Did I agree? Did I understand? Yes. More taking a deep breath. More signing, first one, then the copy. I found myself wondering if I was doing the right thing. There's always that niggle, the second-guessing, the desire to not make the irrevocable so final, to have a choice, a way out, a way back. Mr J wanted to know if I would share why I was renouncing. I told him I'd spent 44 of my 57 years on this planet in Norway and I knew I wasn't leaving. He was amazingly non-committal in his response but not unfriendly. The final document was the actual swearing part. Mr. J made me read it out loud. It did start with "I, Keera Ann Fox, etc." because I'd typed that part in before submitting the forms back on January 2. It's form DS-4080, "Oath/Affirmation of Renunciation of Nationality of United States". I desire and hereby make a formal renunciation of my U.S. nationality, as provided by section 349(a)(5) of the Immigration and Nationality Act of 1952, as amended, and pursuant thereto, I hereby absolutely and entirely renounce my United States nationality together with all rights and privileges and all duties and allegiance and fidelity thereunto pertaining. I make this renunciation intentionally, voluntarily, and of my own free will, free of any duress or undue influence. But as I starting saying the third sentence, something shifted. By the end of that sentence, I was sure my decision to give up this citizenship, to become wholly and only a Norwegian citizen, is the right one for me. I signed the oath, too, in duplicate. There will be no follow-up meeting. Everything will be done via e-mail. I left Mr. J. and the American water fountains. Back to the security cabin to retrieve my bin and my other worldly goods. I told the guards what my errand had been. The most talkative one was from Tromsø. We quipped back and forth about Bergen, its less than stellar soccer team, the problem with Drammen (he thought it was the worst place in Norway; I have no idea if he's right), and his fondness for snow. He pronounced it "sny" (try to say "snee" with a disgusted sneer or an Elvis lip to approximate that). From what I heard from the others, all the nice embassy guards were from all over Norway. Made them laugh when they questioned what a Los Angeleno was doing in Bergen: "Meh, one west coast city is like another." And then I handed back my coat check ticket and left. I took no picture of the embassy. It has never been nor will be my embassy. I was there for just over half an hour. When I left, heading back to the subway to go back into the city center, all I wanted was to go home. Home to Bergen. And I wanted someone to hug me. Even Mr. J. Because I got a divorce. I signed the papers. And it does make me cry. *) I know embassies hire natives (that's part of the deal of getting to squat in another country); I was just wondering when I'd encounter an American as I went through all the processes. I was also surprised at how many guards there were. When I first moved to Norway in 1969, politics here were so left-leaning that they were approaching extremism. Yesterday, in local elections, the Norwegian Labor party (Arbeiderpartiet) once again became Norway's most powerful party, and had its biggest win in Bergen since 1967. A fact that makes me happy now, but which was my bane as a child. So what's changed? The anti-US sentiments of the 1960's and early 1970's that permeated a lot of Europe (partly due to the Vietnam war) eased by the 1980's. The anti-American sentiments I heard as a child, were virtually gone when I came back to Norway in 1981. Since then, Arbeiderpartiet's close ties to Norway's largest union, LO, have loosened, making the party more accessible to those who don't like LO. More importantly, I've changed. Most folks are very idealistic when they are young, protesting everything and wanting to change the world. Later, when we get settled and (usually) wealthier than a student, we also become more interested in keeping the status quo. Me, I'm doing that in reverse. I voted Republican in the first election I was old enough to participate in. Yes, I voted for Ronald Reagan. Only years later did I realize that neither he nor I have any clue about how economics work. And realizing that is what has brought me to being one of the people that helped Arbeiderpartiet achieve a landslide victory in Bergen yesterday. As a permanent resident, I can vote in local elections, and I think it's important that I do. But I haven't always voted left. A part of me still likes the right. I sincerely wish the Republican party in the US was more like it was when I was a child in California: Socially liberal and fiscally conservative. That makes sense to me, but that's not where they went. I see the right wing in Norway admiring today's US right-wing politicians, the ones you see on FOX News. The ones that encourage extremism, racism, bigotry, and inequality. I like living in Norway because it isn't America and I want to keep it that way. I want to stop it from walking the US's path. And so my political leanings have headed more and more left, in spite of myself. What's fascinating is that this election so many of us are running away from the right. Norway's largest conservative party, Right (Høyre) is currently running the country, in a coalition government with our version of the Libertarian party (Fremskrittspartiet). The latter may have scared people off with their heartless handling of refugee children this past year. The right wing government's slashing of taxes for higher earners (sound familiar?) may also have Norwegians thinking. One newspaper has noted that Norwegians are not so stupid as to go along with tax cuts when oil is at only $40 a barrel. Locally, all the bickering within Bergen's right-wing government hasn't helped them, either. I can tell my heart has changed. 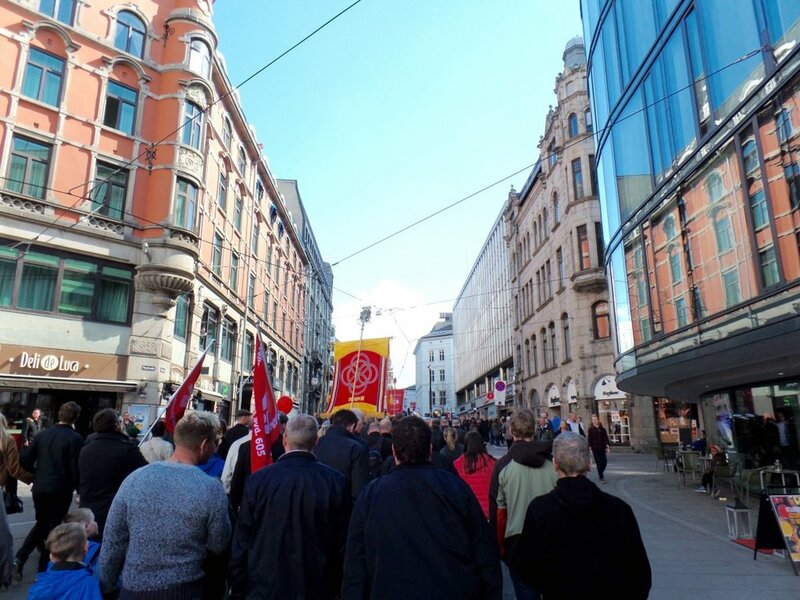 I was in Oslo on May 1st this year, observing Norway's largest International Labor Day parade. And I noticed, to my own amusement, that I was pleased to see the turn-out and the huge LO banners. (You have no idea how ironic that felt at first.) And I was also eager to add to the turn-out, to be identified as a left-winger, a progressive, a liberal, a union member. Caring about others, caring about fairness and equality for all has become more and more important to me with the years. My success and peace of mind is due to the historical efforts of unions and liberal politics, and the resulting job security, pension, and health care. I don't want the right to tear that down; I want it to do what it traditionally does best: Encourage trade and personal initiative. Without the welfare state, I wouldn't have done as well as I have, and I want others to have the same opportunities and safety net I have had. So I voted Labor. Sorry, Churchill.